In deciding whether to have cosmetic surgery, patients should examine many factors that extend beyond the surgery itself. The truth is, the decision to have cosmetic surgery often requires an introspective look at one’s own motivations for seeking cosmetic improvement. Below are some critical aspects one should examine before deciding to undergo cosmetic surgery. It is very important that patients of cosmetic surgery have self-confidence prior to the surgery. While cosmetic surgery will alter one’s appearance, it ultimately will not change how one feels about oneself. We never want our patients to view cosmetic surgery as an emotional crutch, because he or she will likely be disappointed at the outcome. That being said, please be sure you are not choosing cosmetic surgery solely to improve self-confidence. Good physical health is mandatory to undergo any kind of surgery, including cosmetic surgery. To ensure there are no health risks, Dr. Azizzadeh will gather all necessary information about your current health, health history, current medications, allergies and other aspects of your health. From there, he can tailor a specific treatment plan that caters to each aspect of your case. If you have a medical condition that requires consistent medication, this does not necessarily preclude you from surgery. In some cases, such medication is inconsequential and surgery can proceed. In other cases, Dr. Azizzadeh may explore less invasive options that will still help you achieve your cosmetic goals. Smoking is a major consideration with regard to surgery. Because of this, smokers are asked to quit smoking several weeks prior to surgery, which will allow their circulatory system to recover and reach a state suitable for surgery. After surgery, smokers are asked to refrain from smoking for up to two months, at which point they will likely not want to resume. Consider this a perk of cosmetic surgery. Cosmetic expectations—In undergoing cosmetic surgery, you and your surgeon will talk at great length to determine the ideal outcome. During this time, maintain open communication so there is no misunderstanding between doctor and patient. As a double-board certified cosmetic surgeon, Dr. Azizzadeh has developed a specific ability to grasp his patients’ desires and translate them into a tangible result. Emotional expectations—While cosmetic surgery will improve your appearance, it will not change your basic fiber. The best candidates for cosmetic surgery are looking solely for cosmetic improvement and nothing else. A comprehensive consultation with Dr. Azizzadeh is a unique experience. After examining your face and getting a good understanding of your concerns and goals, Dr. Azizzadeh will discuss both non-invasive and surgical approaches, where appropriate. Unlike other plastic surgeons who may only recommend surgery, Dr. Azizzadeh has an innovative perspective of customizing surgical and non-surgical treatments to comprehensively address signs of aging. As a result, you will see an appearance that is youthful and balanced. In many cases, the ideal treatment plan includes both surgical and non-surgical options. 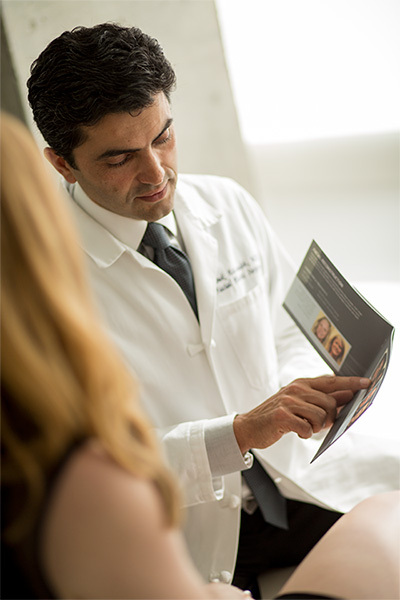 As a highly specialized facial plastic surgeon, Dr. Azizzadeh takes plenty of time to help his patients fully understand their cosmetic options during their consultation. He educates patients on the underlying causes of their cosmetic complaints, along with how each treatment option will address those particular issues. In the complex field of facial plastic surgery, knowledge is the most important thing for a patient, and that is Dr. Azizzadeh’s primary goal. From there, he knows that you will make the right decision for yourself.